In September, we began the year with an exhilarating art project where teams worked together to create a display for one of their favourite library books. 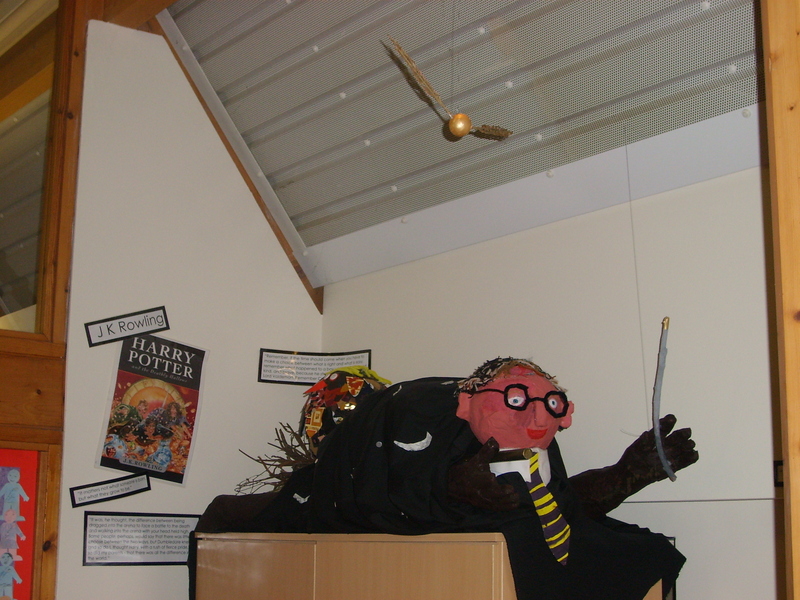 Have a look at these incredible pictures of our school library! This is the Hungry Caterpillar who munched his way through many foods before transforming into a butterfly! Just look at who’s hiding in one of the alcoves! 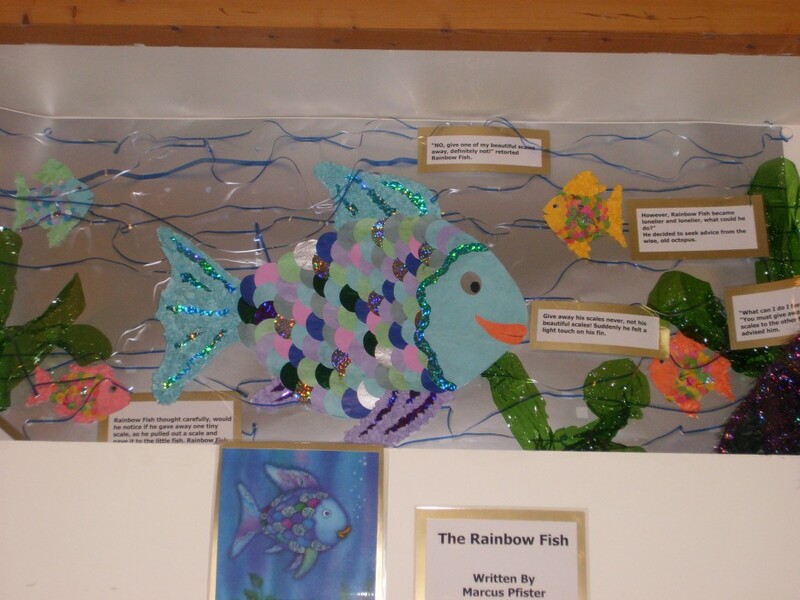 It’s the Rainbow Fish by Marcus Pfister. This is an incredible story about a fish who finds friendship and happiness. Here’s another one of our favourite characters. He may have knobbly knees, sharp horns and a wart on his nose but he is one of our favourite characters. 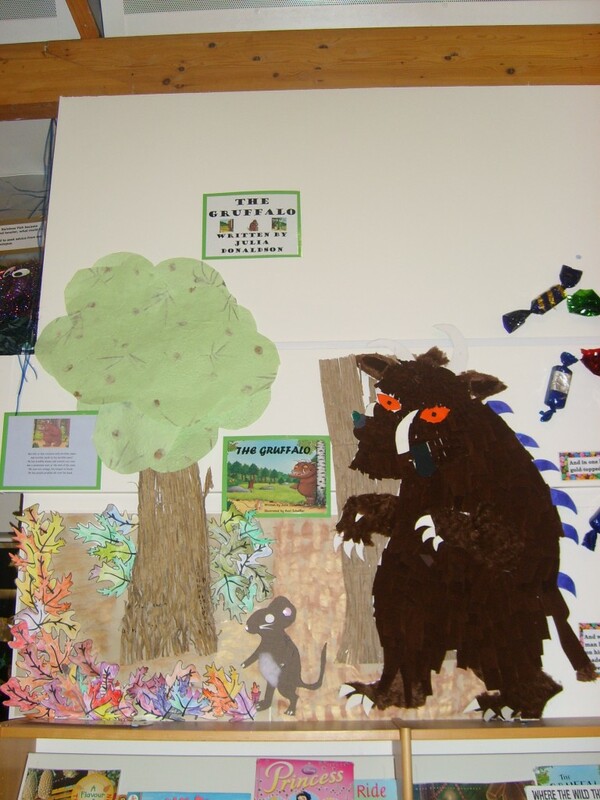 It’s the…Gruffalo (an award winning book by Julia Donaldson). Above Mrs Adam’s door, hiding amongst the leaves of the trees, is a breath-taking sight. 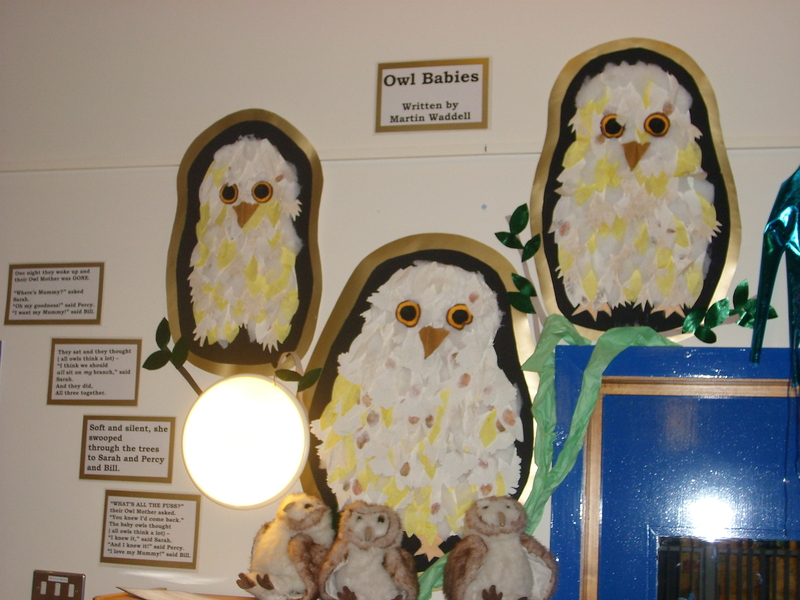 It’s the Owl Babies from the beautiful picture book by Martin Waddell. Wow! Look who it is! 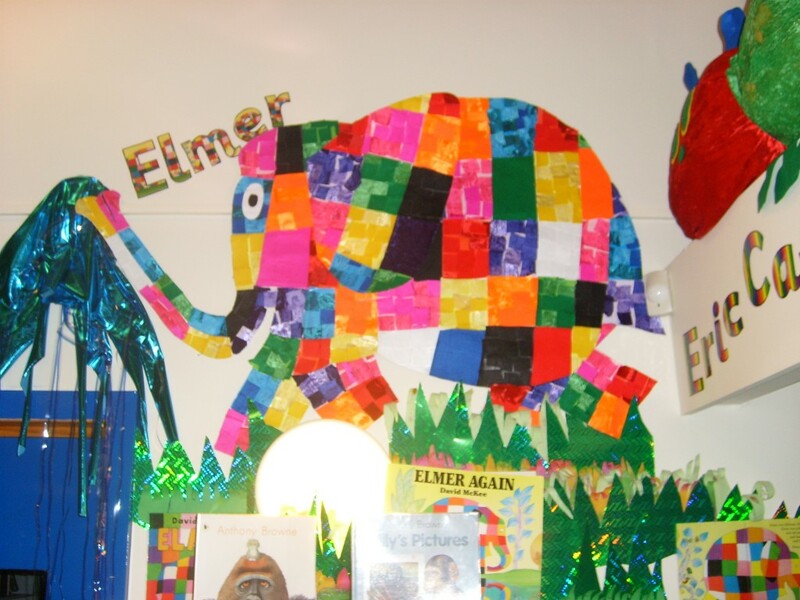 It’s Elmer the Elephant. This incredible story tells the tale of an elephant who tries to blend in with all the other elephants by painting himself grey. However, he soon realises that it’s best to let your true colours show! Watch out! It’s Harry Potter from The Philosopher’s Stone and he’s reaching out to catch the snitch! This mesmerising book by J.K.Rowling has to be one of our favourites. Mmm…chocolate, candy, sweets! 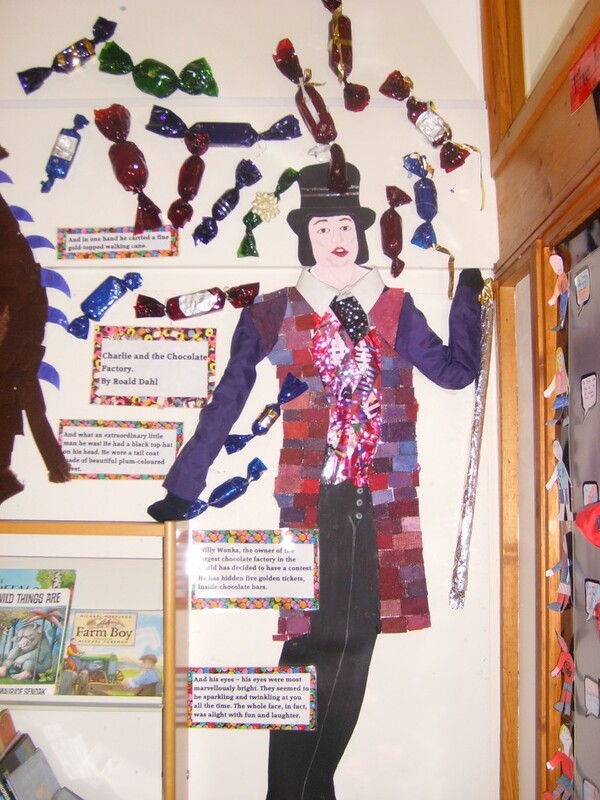 It has to be the one and only Willy Wonka from ‘Charlie and the Chocolate Factory‘ by Roald Dahl. Read this book if you want to lose yourself and wake up in a fantasy land filled with Oompa Loompas and an endless supply of sweets! Here’s another one of our favourite adventure stories -‘The Chronicles of Narnia‘ by C.S.Lewis. 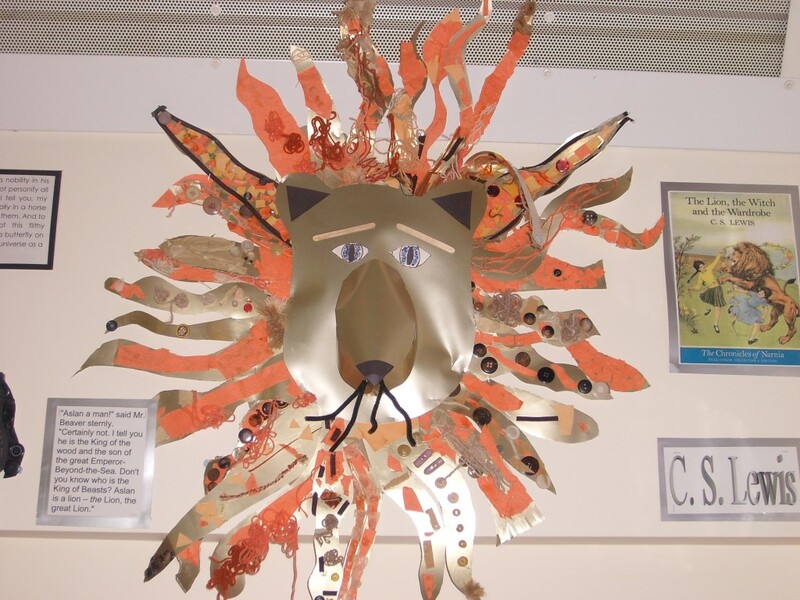 and here is one of our favourite characters, Aslan, the talking lion! ROAR! Creak…groan…what’s that coming from the corner of the library? 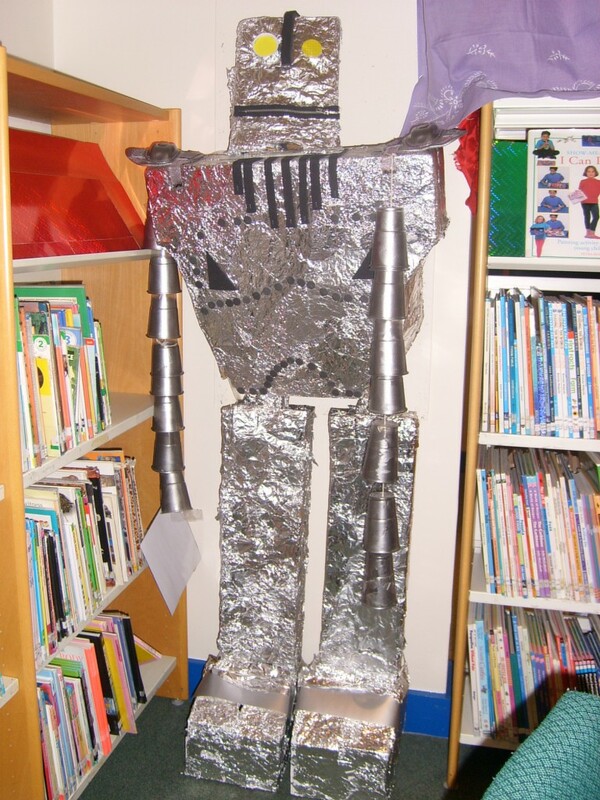 It’s the Iron Man by Ted Hughes, an inspiring tale about a metal giant who finds himself on planet Earth and begins by destroying farm machinery but soon befriends a boy and ends up protecting planet Earth! Here’s another one of our absolute favourites. 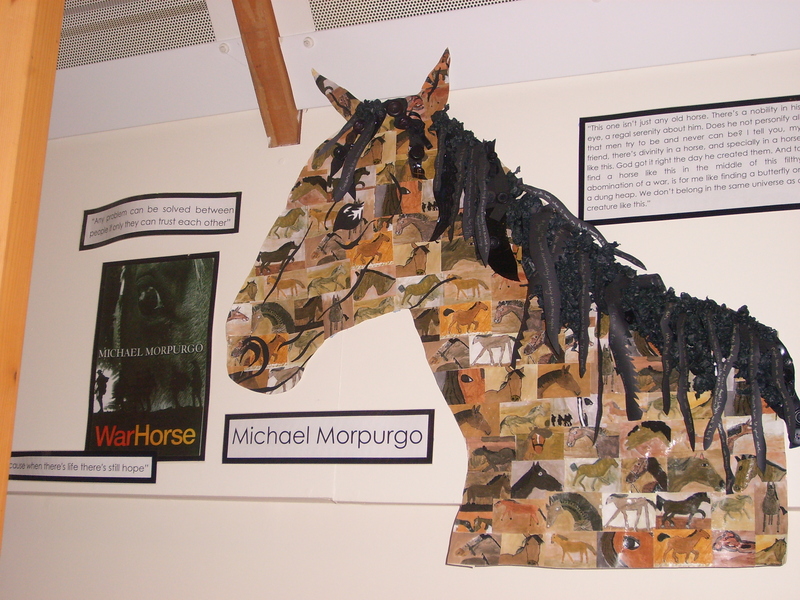 This is Warhorse by Michael Morpurgo. It has to be one of the most incredible books of recent times, told from the point-of-view of a horse as he fights in the First World War and tries, desperately, to be reunited with his first owner. 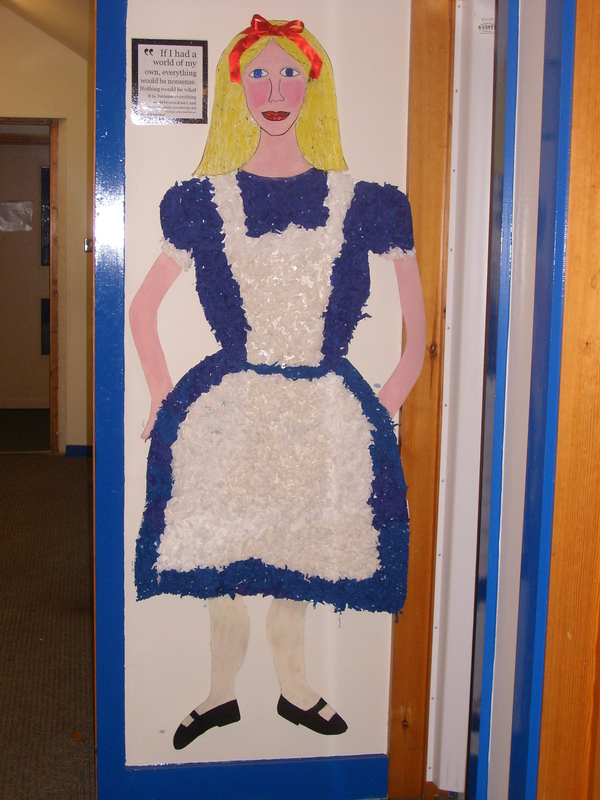 And last, but by no means least, we have a classic by Lewis Carroll – Alice in Wonderland. This is a magical tale about a girl who stumbles across a rabbit one day as she goes for a walk and before she knows what’s happened, she finds herself in Wonderland! I think everyone worked extremely hard on their classes’ projects. It makes the library a much more nicer place to be! I am extremely proud of my classes’ project (War Horse) and all the other master pieces are fantastic!! 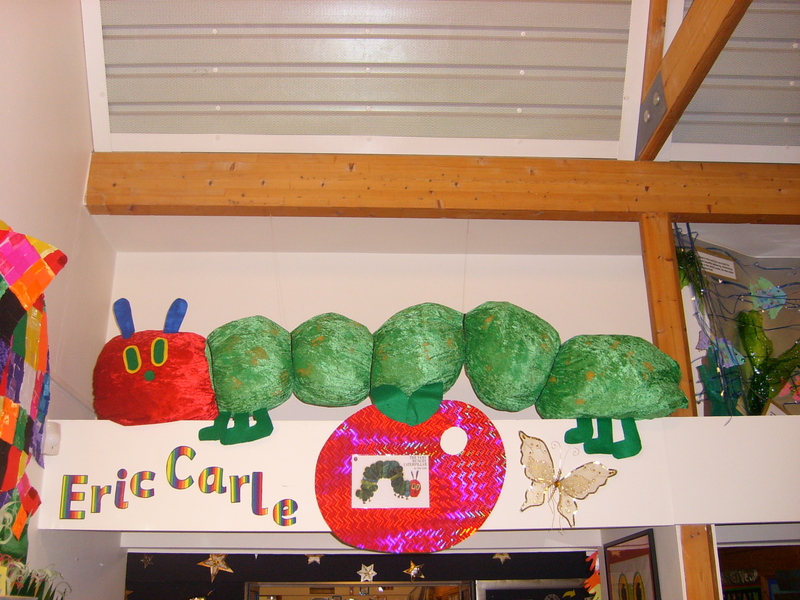 Well its been a while since we made our library turn to a magical wonderland, but I look up to the sky every time I come to school to find a hungry caterpillar! Nom nom. I am so proud of our schools effort to make an amazing learning environment for every single one of us! However, I haven’t been able to find where the rainbow fish is and the Gruffalow… maybe I could have a search around the school today. Every class has tryed so hard and put 100 % effort in everything . 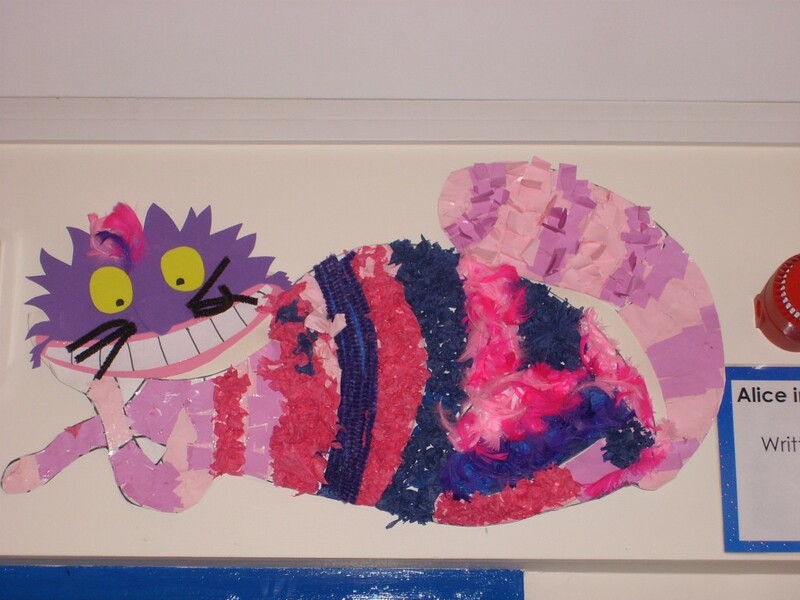 I think every one worked very hard on making these sculptuurs and I helped make alice and the cat I was in hazel class I thought it was fun. I loved making these sculptures!! I can remember when I was in year 4. We were doing our chocolate exit point!